If your PC is behaving in weird and annoying ways, there's a good chance that the problem, no matter how gnarly it seems, is related to the Power Supply Unit (PSU). Crashes, file corruption, video glitches, 1003 kinds of ridiculous Windows error message; all can be the fault of flaky power. A lot of problems don't have anything to do with the PSU, of course, but it's still a good idea to make the PSU the first thing you swap out of the machine once you've been driven to the shotgun debugging stage. A replacement PSU is cheap and swapping a PSU is easy. It'd be nice to be able to tell for sure whether you need to, though. If the PSU's A-OK and it's the motherboard that's hosed, the time you spend on fruitlessly swapping power supplies could be more profitably spent. You can do PSU testing to some extent while the supply's in the machine and running, by using a multimeter or two. Set the multimeter to an appropriate DC volts range, tease out a spare four-pin drive power plug from your rat's nest well-tidied airflow-encouraging cable loom, and stick the multimeter probes into the hole-pins fed by black and yellow wires to test the +12V rail, or black and red for +5V. With a couple of multimeters or a fancy dual-display model you can monitor both rails at once, and this strategy lets you do normal stuff with the PC and see exactly what the actual rails are doing, not just what the motherboard's questionably calibrated and possibly slow-to-respond monitoring hardware thinks they're doing. 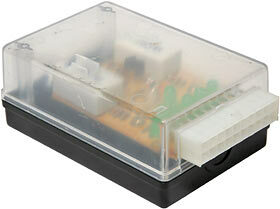 Without stripping wires or making Y-adapters, though, you can't monitor the +3.3V rail, or any of the negative rails. +3.3V, in particular, is very important; it's what almost all modern motherboards use to power the CPU. What would be nice would be a gadget you could just plug a PSU into and instantly see whether it was working properly. This is an ATX Power Supply Tester that ostensibly carries the Connectland brand, though this is an "OEM" product that just comes in a little white box, with no branding at all. According to Peridyme, the local Connectland distributor here in Australia and the people we can thank for this elephantine page, Connectland is better known in Europe and France than anywhere else. But apparently not well enough known to actually rate a Web site. I wouldn't be surprised if people outside Australia could find this same tester under various other brands. Here, for instance, is a review of the exact same thing sold under the internationally renowned Powmax brand. Anyway, here in Australia, Peridyme are selling the tester for $AU36.30. That's about $US28, as I write this. ...a bunch of green LEDs light up to tell you if the PSU's OK. Not all of them will light if it isn't, and there's one red LED to tell you if something's really screwy. Now, anybody who knows one or two rudimentary things about electronics will realise that this little tester (the circuit board's about 65 by 46mm in size), with its two five watt wirewound resistors, is not going to come anywhere near to fully loading any PC power supply. A proper test rig for power supplies needs to be a lot bigger, with much better cooling, so it can actually sink some significant portion of the hundreds of watts the PSU's made to deliver. Such rigs can be safe, or they can be cheap, which is why you won't find any on the retail shelves. Instruction manuals that say things like "Immerse the coils in a bucket of water (not included), while making sure not to allow them to touch; if you smell burning, discontinue use" tend to attract the attention of governmental regulatory bodies. Just because this tester doesn't have a dummy load dial that goes up to a kilowatt doesn't mean it's useless, though. I was interested to see what it's actually doing. The project-box casing (with an unused cutout at the opposite end from the ATX connector...) is only held together by a couple of screws, and the circuit board's held in place by a couple more. It's a simple single sided single layer board, so it's easy to trace the circuit. Well, easy compared with tracing motherboard circuits, anyway. Not easy compared with eating peanuts. The tester unifies most of the identical wires from the PSU, which is OK; all of the +3.3 and +5 and ground wires it joins together are joined together inside the PSU as well. They only get separate wires to the plug to increase the cable's current capacity. If one or more of the wires has come loose then this tester won't tell you, but that's a rare fault. +3.3V goes to ground through the ten ohm resistor, +5V goes through the 15 ohm one, so we're talking loads of about one and 1.7 watts, respectively. This should be enough to settle down a PSU that gives wiggy voltages if totally unloaded, but it's very close to zero load by the standards of even a humble 150W AT supply, much less a modern tweaky 500W unit. The -12V rail just goes to ground through a resistor, which is OK but won't light the red DANGER LED if there's something severely wrong with it. The -5V rail gets a fancier two-pathed monitoring setup, involving the red LED. 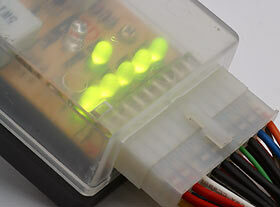 The red LED should also light if something's Very Wrong with 12V or +5V. Pins 17 and 20 on the ATX connector aren't connected to anything, but that's OK; they're just another ground and one of the +5V wires, located in places that'd need wire links to get them connected to the others, so the designers didn't bother. I have, in the past, reviewed hardware fault finding gear that didn't work. This, for instance. The Connectland tester does work, and could prove very handy if you often have to diagnose stone dead PCs. This is not a device for finding subtle PSU faults, though. It won't tell you about slight undervoltage or overvoltage, and it won't load up the PSU enough for you to be able to see if it sags or glitches in normal use, and its red LED won't "latch" on if the PSU briefly goes nuts and then returns to normal. If you've got a computer that's in Paperweight Mode, though, this little box ought to do just fine at telling you whether it's worth yanking the PSU or not. Just unplug the ATX cable from the motherboard, plug it into this tester, and you ought to immediately know whether the failure to proceed is thanks to the PSU or not. 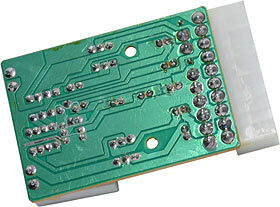 The Connectland tester could also easily be hacked into a fancier voltage-monitoring unit; you could trivially add some beefier external load resistors (especially if you're happy to use a ten-seconds-on, ten-minutes-off-to-cool duty cycle), or just meter connections to show you what the rails are actually reading. You can, of course, also just plug your multimeter into drive power connectors while using this tester. Since the Connectland tester will fit (somewhat uncomfortably) in a shirt pocket and only costs $AU36.30, I think it's quite worthwhile piece of kit, for those who'd be able to use it more than once in a blue moon. 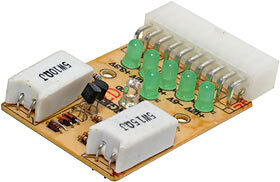 Review Power Supply Tester kindly provided by Peridyme.